The roadworthy NS Design NXT Electric Upright Double 4-String Bass With Amber Burst Finish is an exciting and reliable partner for the most demanding performance career. A wide array of interchangeable support systems make the NXT adaptable to virtually any situation. 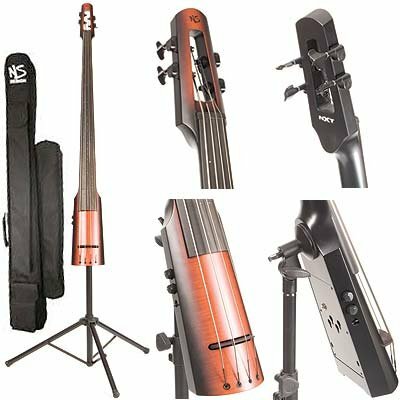 This package includes the NS Design NXT Electric Upright Double Bass with Amber Burst Finish along with a self-supporting tripod stand with full adjustments for height and angle and a soft case complete with a shoulder strap. NS Electric Strings and most traditional acoustic strings fit all NS Design Double Basses, allowing the player to select from a wide range, each with a unique sound and feel. In combination with the easy adjustment of basic set-up parameters, the NXT Series Bass is adaptable to many different styles of music. The NS Design NXT Electric Upright Double 4-String Bass With Amber Burst Finish opens up a new horizon for the serious bassist looking to play a great instrument on a limited budget. These instruments, crafted in the Czech Republic by the makers of the renowned CR Series, exemplify flawless workmanship at an incredible value. This model has a beautiful Satin Amber Burst finish.